U.N. peacekeepers on Friday found the bodies of 16 people believed killed in a surge of gang violence, the latest sign the Haitian capital may be slipping back into disorder after months of relative calm. Sri Lankan troops found the bodies Friday morning in the southern Port-au-Prince slum of Martissant, a U.N. statement said. The slum was the site of a recent spate of gunbattles between warring gangs. The victims apparently were shot to death in an hours-long gunfight among gang members fighting for control of the dense area, said Pierre Esperance, a local human rights activist. "The people who died were civilians, not gang members," said Esperance, whose National Coalition for Haitian Rights has monitored gang activity in the slum. Including the latest deaths, he said at least 30 people have been slain in Martissant since June 1. 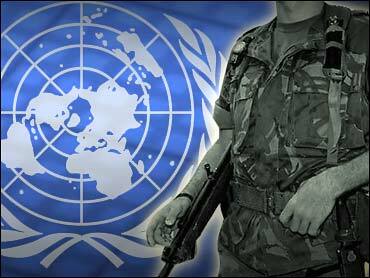 The Brazil-led U.N. peacekeeping force stepped up patrols where the bodies were found. Many residents fled the area for fear of more attacks, local radio reported. "The military forces ... currently control the area of where the incidents occurred and have increased their patrols to protect the population and prevent more acts of violence," the U.N. statement said. The deaths were the latest in a series of killings and kidnappings that have gripped Haiti's tense capital in the weeks since the May inauguration of President Rene Preval. It was unclear whether the recent violence was politically motivated. "The security environment in the capital is not good at this time," Esperance said. The violence has raised fears of a return to the mayhem following a 2004 revolt that toppled then-President Jean-Bertrand Aristide. The impoverished Caribbean nation had been relatively calm since Preval's Feb. 7 election victory. Sophie Boutaud de la Combe, a U.N. spokeswoman, said U.N. police would work with Haitian authorities to investigate Friday's deaths. Police say gangs stage kidnappings as a source of income, but others believe they are waging attacks to pressure Preval to return Aristide, his one-time political mentor, from exile in South Africa.